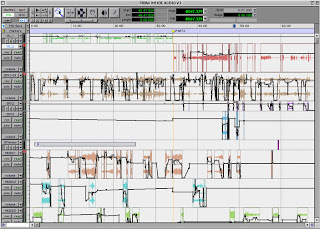 Rough mixing audio. That's a lot of up & down for a rough mix isn't it... What can I say? I'm picky. Both temp and final elements are in this session. Audio is being done in Pro Tools, and yes that's an OS 9 window. Remember those? They had window shades. Which I miss, here, in the future.